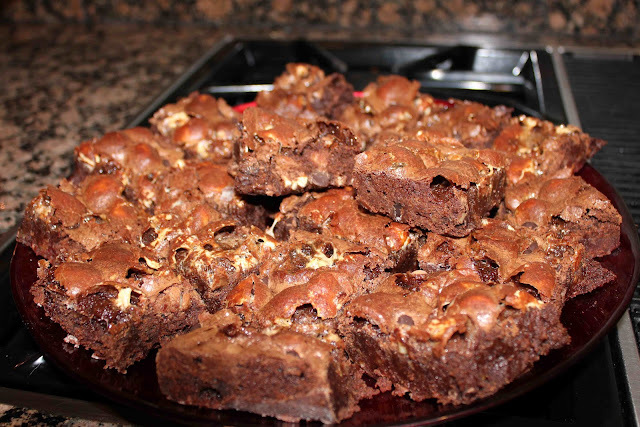 I’ve got lots of stories revolving around these brownies. One time a made these for some friends when I was in college. My best friend at the time told me that she had never heard of nor eaten “homemade” brownies!! WHAT? How is that possible, I thought? She had always eaten brownies from a box. I of course introduced her to some homemade cookies too. Boy, she was sure missing out! Now she emails me all the time for recipes. Another time was when Matt and I were at the lake with family. His cousins had just made brownies from a box. Since we were all chocoholics and finished the brownie pan in one night, Matt told everyone that they must try my secret ingredient brownies. We went to the store the next day and I taught Matt’s cousins how to bake using this recipe. I remember his youngest cousin just sitting in front of the oven, starring at it for 35-40 minutes while they cooked because she was so excited to try those brownies! My dad always has people try and guess the secret ingredient. Can you guess by the picture? Well, the secret ingredient is…..MARSHMALLOWS! 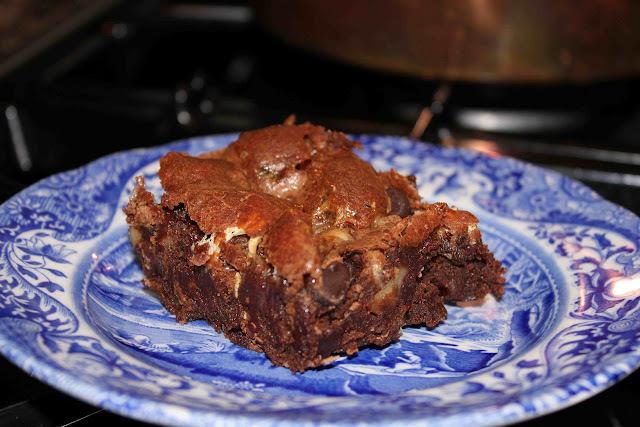 During cooking time, the brownies puff up, but once they cool, the marshmallows seem to “disappear” and you are left with a large airy pocket within the brownies. 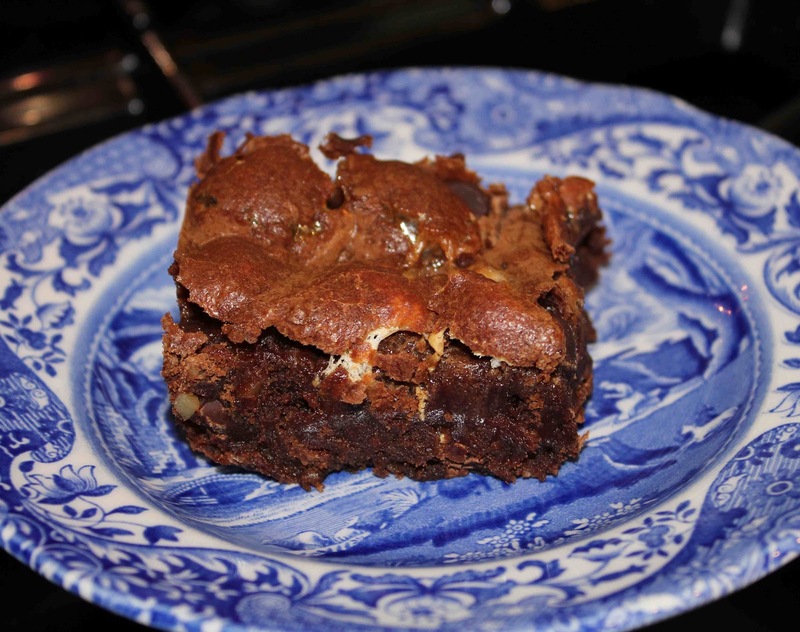 These are moist, chocolatey, chewy, and our most favorite brownie recipe. I eat mine with a scoop of homemade vanilla ice cream when they are warm. Enjoy!! Melt chocolate and butter in a large saucepan over medium-low heat. When chocolate and butter have melted, let cool for 15 minutes. Then beat in eggs and then whisk in sugar until combined. Add flour and vanilla, and stir to combine. 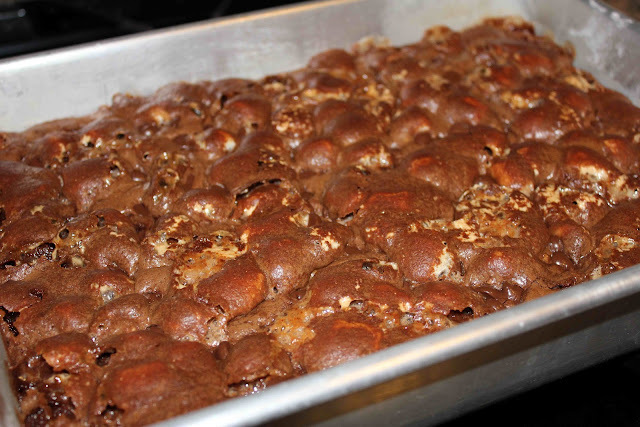 When mixture is combined, fold in mini marshmallows, pecans, and chocolate chips. Pour into greased 9 x 13 inch baking pan and sprinkle with remaining (1/2 cup) chocolate chips. Bake at 350 degrees for 30-35 minutes or until brownies start to pull away from the edges of the pan. Cool in pan on a wire rack for 10 minutes. You can serve warm (with vanilla ice cream), or wait until they cool to room temperature. 1. Melt chocolate and butter in large saucepan over medium-low heat, stirring occasionally. Cool 15 minutes. 2. Add eggs; stir until blended. Stir in sugar until combined. Add flour and vanilla. Fold in marshmallows, pecans, and chocolate chips. 3. Pour batter in a greased and floured 9 x 13 inch pan and sprinkle with 1/2 cup chocolate chips over the top. 4. Bake at 350 degrees for 35 to 40 minutes, or until the edges start to pull from the side of the pan. Cool brownies in pan on a wire rack for 10 minutes. Can be eaten warm or at room temperature. One Response to "Mom’s Secret Ingredient Brownies"